Join us for our next Behind the Scenes Tour of the Maryland State Medical Society building, better known as MedChi. The Society was founded in 1799 as the Medical and Chirurgical Faculty of the State of Maryland (Chirurgical was the common spelling of surgical at the time). We will have a unique opportunity to tour the building that has been home to the Society since 1909 and, maybe, even get to meet the resident ghost! RSVP for the tour today! On-street parking as well as area lots are available. Wine and cheese will be served. In January 1799, the Maryland Legislature approved a petition for a charter to incorporate a society of physicians in Maryland to be known as the Medical and Chirurgical Faculty of the State of Maryland. As written, this special act of the Maryland Legislature was intended to “prevent the citizens (of Maryland) from risking their lives in the hands of ignorant practitioners or pretenders to the healing art.” The society became the seventh of its kind in the country, and some of its notable achievements include the creation in 1807 of what became the University of Maryland School of Medicine, the establishment in 1830 of a medical library, and the creation of the Baltimore College of Dental Surgery in 1839 that was the first institution of its kind in the world. MedChi has been in its current building since 1909 and Dr. William Osler, co-founder of the Johns Hopkins University School of Medicine, is given credit for the creation of the MedChi library that is still housed there today. When Dr. Osler arrived in Baltimore in 1889 he was disappointed to find that the Society’s library consisted of only 7,000 volumes of outdated and dilapidated books. He convinced the Society to purchase a building on Eutaw Street for use as a library but the collection soon outgrew the location. 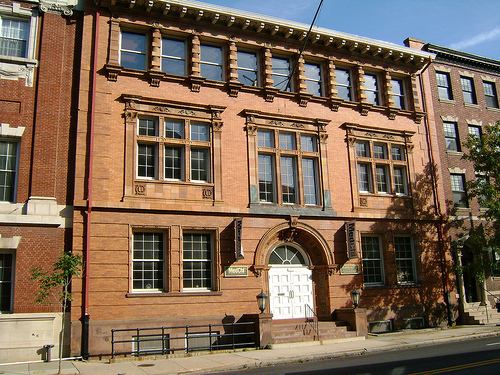 The Society purchased a lot at 1211 Cathedral Street and dedicated the current building in 1909. Modeled after the medical society libraries of Boston, Philadelphia, and New York City, the building included a roof-top apartment (described by the Baltimore Sun identified this as the “first penthouse in Baltimore”) and a garden for a full-time, live-in librarian. The building was later renovated in 1962 by University of Maryland architect Henry P. Hopkins. And finally there is the resident ghost, long-time librarian Marcia Crocker Noyes, who many believe still tends to her library over sixty years after her death. Ms. Noyes was the librarian for 50 years and lived in the “penthouse” on the top floor of the building until her death in 1946. Her funeral was conducted in the library’s Osler Hall with 60 of MedChi’s physicians serving has honorary pallbearers. Over the years many employees and researchers have reported unexplained noises. Footsteps are heard on the cast-iron stairs in the stacks but no one is seen. Book truck wheels are heard squeaking along when visitors know they are the only ones in the library. In addition to living tour guides with our hosts at MedChi and a world of information about the building and over 200 years of medical history in Maryland, perhaps Ms. Noyes will come out and greet us in her beloved library on the evening of our tour. This is the building where many of my friends and I attended a Baltimore City public accelerated junior high school. I was in the last graduating class – 1960. I don’t know when BCPS started using the building. When I attended P.S. 49, the MedChi offices were housed at the building at the end of the block where Preston St. intersects Cathedral. The girls used the gym (Maryland Ave.) at the other side of the building’s courtyard and the boys walked to the Richmond Market gym. I don’t know if the BCPS rented this building from MedChi or what the story was. I have many good memories of this building and excellent teachers. The 1909 MedChi building described in the article is actually next door to the one in the photo. You can see a little of it on the left. The building in the photo was a Baltimore City public school for many years and was eventually bought by MedChi (in the 1980’s, if I remember correctly).